Raise your hand if you’re getting sick and tired of making the same old, same old side dishes to go with your meals every week? I’m in that boat. I try to make easy things like rice or potatoes… but I end up just going with basics, and then everyone (including myself) is really bored with dinner. Here’s a new side dish recipe you can try. It’s great served with chicken or meats. 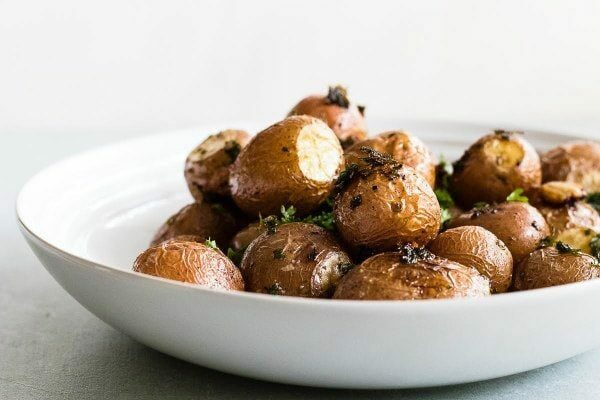 This recipe calls for small red potatoes. 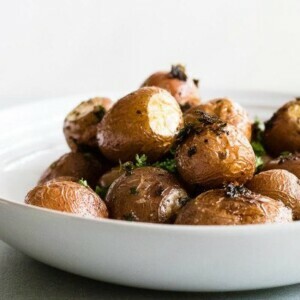 You can cut off any imperfections on the potatoes before preparing this dish, but I like to cut off the ends of the potatoes for presentation reasons. That’s totally up to you. These potatoes take about an hour to bake (with a good amount of garlic that will be roasted and delicious!) So I usually throw them in first thing… before I prepare the rest of my meal. It’s okay if they finish early. What I love about this recipe: the roasted garlic is fabulous. And there is plenty of butter. A little salt and some fresh parsley finishes it off. My family now requests this side dish quite often! Preheat oven to 375°F. Spray small rimmed baking sheet with cooking spray. Scrub potatoes and slice off any imperfections. Pat dry. Place on baking sheet. Smash garlic cloves with side of large knife to loosen peel and release flavor. Place garlic in pan with potatoes. Pour melted butter over top of potatoes. Stir to blend flavors. Sprinkle with salt and parsley. Bake at 375° for 45 minutes to 1 hour. Remove potatoes to a bowl. 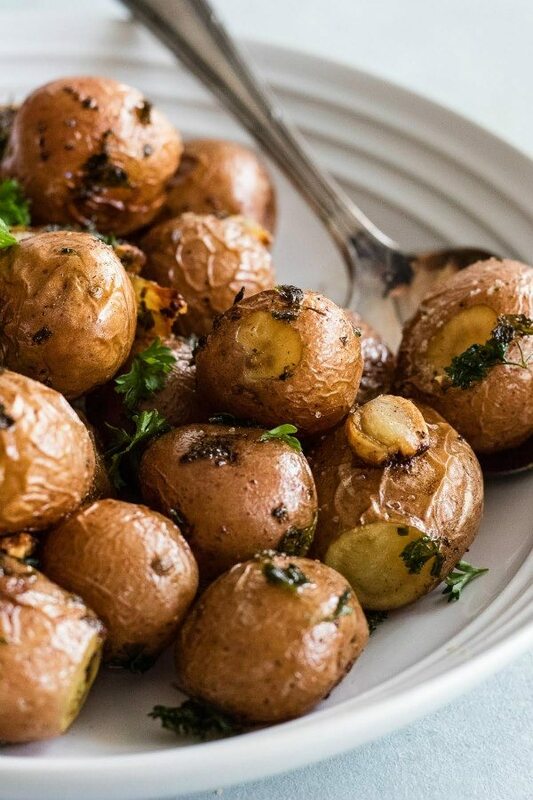 Squeeze cooked garlic onto potatoes as well as browned butter and parsley bits. Mix flavors together and serve warm.